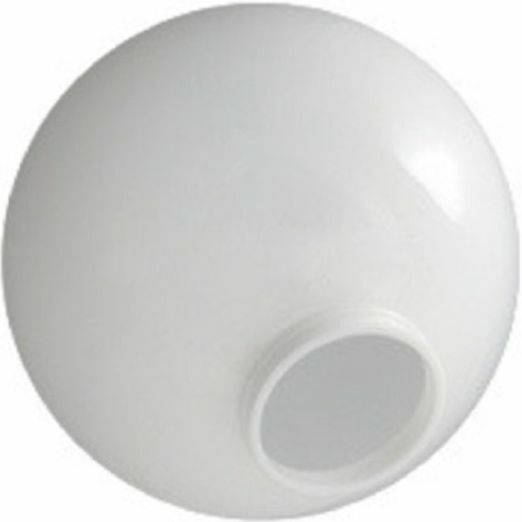 Globes are white acrylic, 8 inches in diameter with a neck and solid flange OD of 3.91 inches to be used with a 4 inch fitter. They are one piece injection blow molded, water and shatter resistant with UV inhibitors to help prevent yellowing. I bought this globe to replace an antique glass one that had been in my husband's family for many years. It fits perfectly on the lamp base, and gives a wonderful soft light. Better still, it is lightweight and easy to handle. It arrived quickly, and in perfect condition. It's given new life and light to a cherished antique (not me, the lamp). Thank you very much!